After a bit of a long silence I wanted to break some news. Our gaming group is trying out some “new” things – namely testing out a larger scale game called Bolt Action by Warlord Games. For our blog, this will mean that we are also going to be showcasing some 1/56 scale WWII miniatures, but if you are only interested about our 1/100 scale stuff dont worry – more of that is sure to follow too. 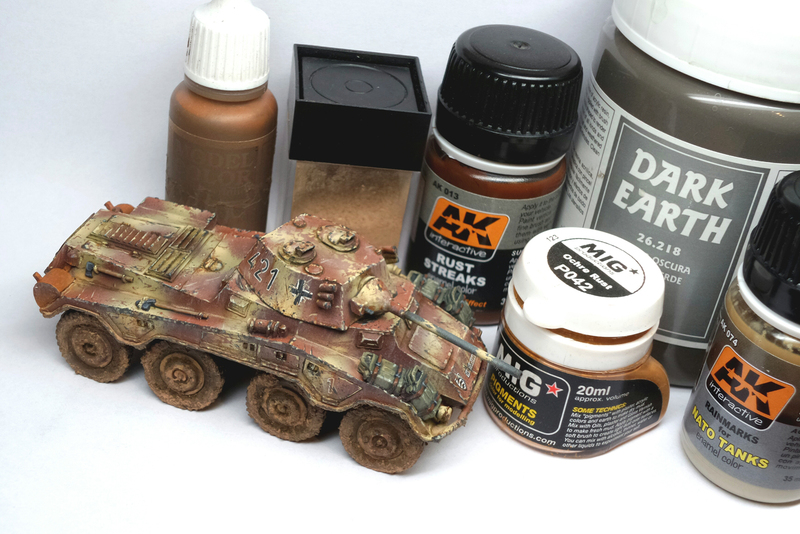 I havent been painting 1/56 scale models in ages. Like most miniature gamers tough, I started with 1/56 so I am sure it will all come back to me eventually. Some stuff that works in 1/100 does not work that well on larger scales, and vice versa. However, to start things off I wanted to paint something relatively simple and do some testing. I figured that if I take some pictures between phases, I might get a nice little tutorial out of it for you guys. 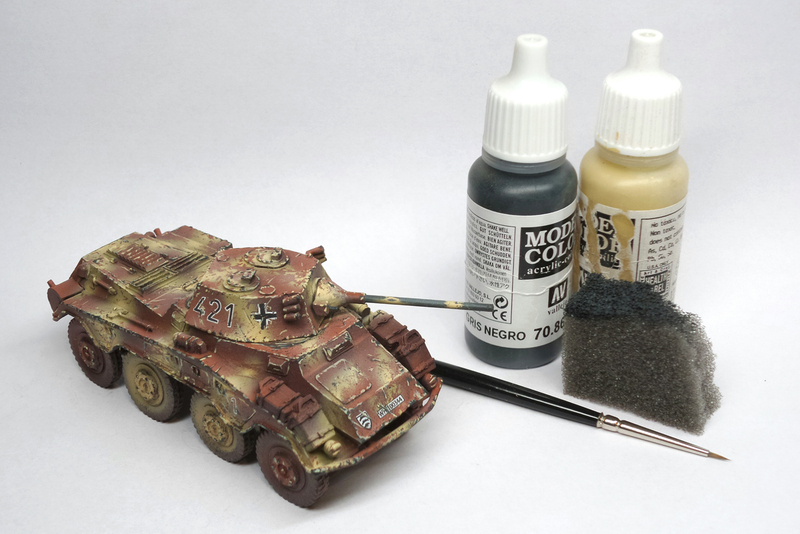 I chose Sd Kfz 234/2, or better known as Puma as my sparring vehicle and decided to try a few key techniques and try and keep the whole process as clear as possible. I will not go into specifics of techniques, but rather tell which techniques where used and when. 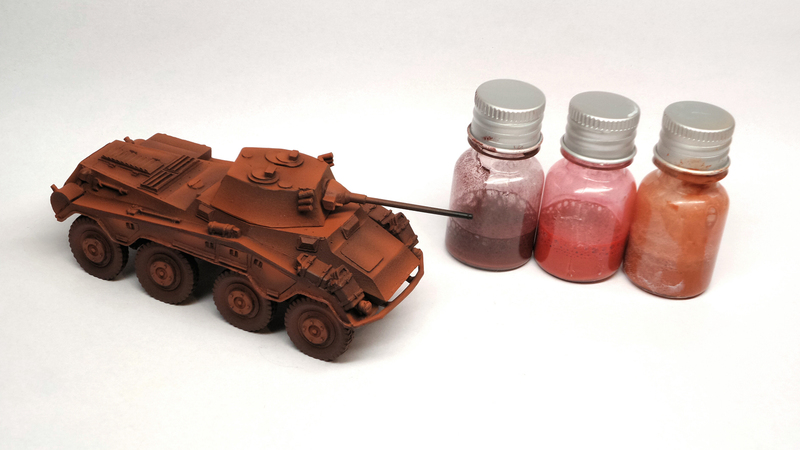 First I primed the vehicle black and then mixed three tones for a primer red colour modulation. I used normal Vallejo colours mixed with Pirkka window cleaner. Pirkka is a local brand but I am told that Windex is a similar product. Have not used it myself tough. Basicly, you want a window cleaner that is ammonia free. Window cleaner breaks the surface tension of the paint, so the mixture flows better. I use window cleaner instead of water, roughly 50/50 mix depending on the paint. Now, the modulation itself is done to a very dramatic standard. At this point, you want to modulate the colours rather strongly as the effect will dillute the more you paint over it. After taking this photo I also painted the barrel of the gun grey, as this was usually the colour used for heat resistant primer. After the paint had dried I went and sprayed the whole model with vallejo satin varnish, again dilluted with window cleaner. Next, after the varnish had fully hardened, I sprayed some light coats of hairspray straight out of the bottle on to my red primer. Some people spray the hairspray out of the bottle first and use an airbrush to have better control, but seeing I wanted to move fast I sprayed straight out of the hairspray bottle. The more you spray, the easier the next coat of paint comes off. 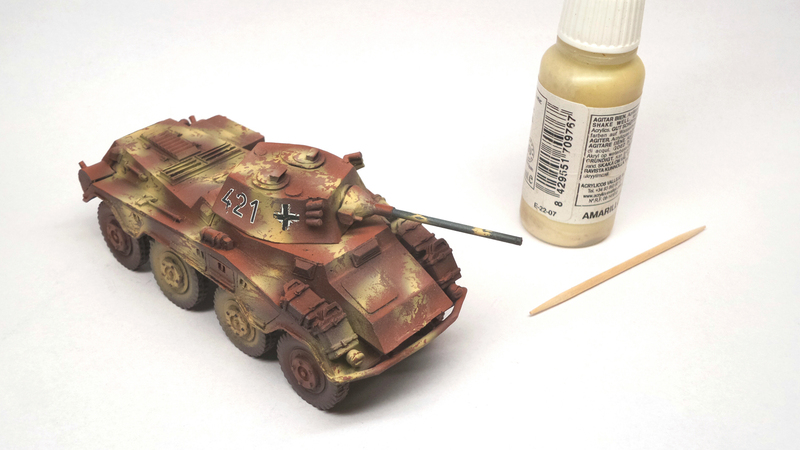 I wanted to make some soft edged stripes of dunkelgelb on my Puma, and the idea was that after painting the stripes I would wear them down using various techniques. For the dunkelgelb I mixed my own tones again using vallejo and window cleaner. Soft edge camo is harder to modulate, but I did some modulation regardless. At this point you just need to believe that it will all work in the end. Depending on how much hairspray you have between the layers, go slowly and add water to the surface using a brush, or a wet fingertip for instance. As you wet the surface, the hairspray disolves and reveals the red primer underneath. This water aplication takes practice, so try not to remove too much of the paint you added on top of the hairspray. Scratching the surface with a cocktail stick, tweezers, etc. will yield nice sharp little scratches, where big brushes or fingertips with just a little water will give a more general wearing. Mix and match as you see fit. After you think you are done, seal the results using varnish. I used vallejo satin varnish mixed with window cleaner again. I added some dry decals by AK before I sealed the colours in place. After some additional waterslide decals and more varnish we do some heavy chipping. I might have gone a bit overboard with mine, but as this was a test subject I did not stress about it that much. Using a ripped blister sponge I dabbed some black grey everywhere I saw fit. I also used a fine brush to make sharper scratches here and there. To really bring the detail up, I used a very light version of Vallejo Buff to emphasize the scratches, painting some light under the dark scratches. Using yellowish colour for the scratches on the red might not be that realistic, but I wanted to really play with the contrast and try to do some overall vehicle shape profiling trough scratching with a light colour. 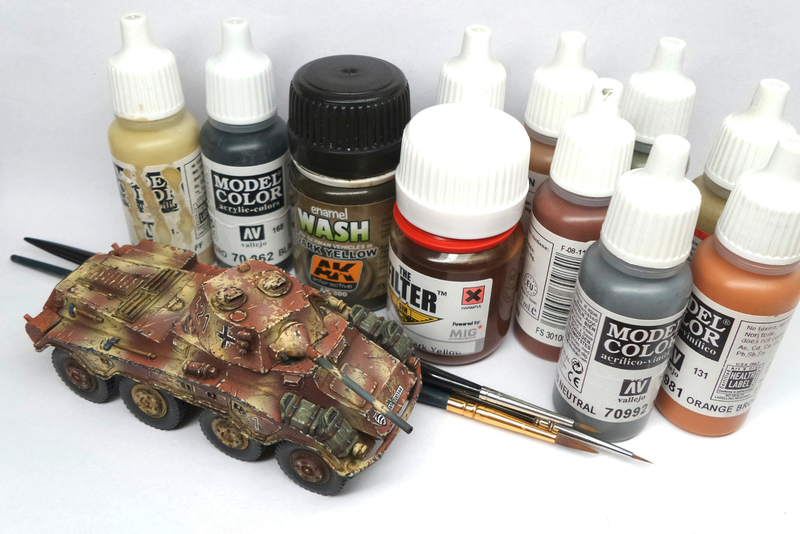 I then did some dark profiling using AK enamel wash for dark yellow by painting it to all the nooks and crannies on the vehicle using a fine detail brush. After the wash had dried fully, I painted a layer of brown filter on top of everything to further bring the paintjob together. 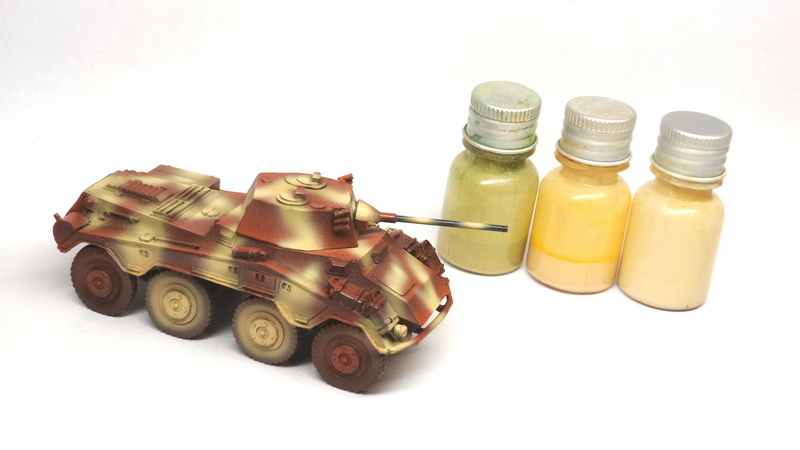 Next we paint all the little items like gas canisters, tools, tires etc. using basic painting techniques with acrylic vallejo paints. After this we again seal the painting done using varnish, as in the next step we will use more enamel based paints and we dont want them to mix with what we allready have done. I started to weather the vehicle using AK rust streaks and rain marks. I used odorless thinner to better manipulate the effects. I also used some light rust pigments on the exhausts. Then I airbrushed a brown paint mix to the underside of the vehicle and also a bit on the wheels, trying to stay clear from the hubs. After the paint dried I made a mix of sand, turf, brown paint, vallejo dark earth pumice and light brown pigment dust and applied it generously to the underside and wheels where I tought it needed it. After the mixture had dried out, I made another mixture – this time with only tab water and my light brown pigment dust. I used the brown water to paint the wheels and the underside keeping it fairly random, letting it pool to some places and removing it from where it shouldnt be. I also added some on the hull. After the water evaporates, you get this nice effect with the pigments and just by touching you can remove it where you dont want it. After some brushing and cleaning the pigments away I sealed the pigments using enamel based pigment fixer trough an airbrush. The last thing I did was adding random spots of brown enamel wash to the center of the wheels and around the hubs to give even more nice contrasts to the muddy texture. Our end result from several perspectives. In all the excitement I painted the rainmarks from top to bottom rather than bottom to top, but as this is just a gaming piece I dont mind the little mistakes. I hope you got something out of my little Puma project, as for me it was a fun thing to do.